Van Nuys Airport (IATA: VNY, ICAO: KVNY) Known for years as the busiest general aviation airport in the U.S., Van Nuys Airport has an 8000 foot long runway that services a variety of business jet and general aviation aircraft. Van Nuys Airport opened in 1928 as privately-owned Metropolitan Airport, with intersecting grass runways on what was a bean field. A film documenting the history of Van Nuys Airport was released under the name “One Six Right: The Romance of Flying”, named after the longer of the two runways at the airport. The airport was prominent in other films as well, including “Casa Blanca“, “The Bodyguard”, and Howard Hughes’ “Hells Angels”. 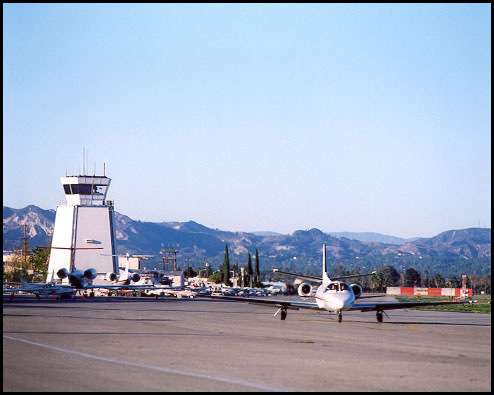 Located in the heart of the San Fernando valley, Van Nuys Airport is the destination of choice for flyers wanting to visit Encino, Calabasas, Simi Valley, the Getty Museum, and Cal State University in Northridge. It is close to Hollywood and Universal Studios as well. When Santa Monica Airport can’t accommodate arrivals or departures due to noise or curfew restrictions, or when the coastal marine fog layer reduces visibility, Van Nuys becomes the best option for passengers living or working in Pacific Palisades, Brentwood, Bel Air, Beverly Hills, West Los Angeles, and Malibu. Desert Jet flies clients to and from Van Nuys regularly. We have quite a few clients with winter homes in the desert, as well as golfers, polo players and show horse riders. We also provide jets for celebrities attending fund-raising events and performances in the desert.